Leading Wholesale Distributor of smart temperature transmitter from Pune. 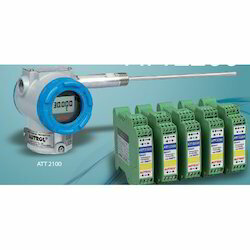 The AURTOL Smar t Temperature Transmitter is a microprocessor-based high performance transmitter, which has flexible sensor input and output, automaticcompensation of ambient temperature and process parameters, configuration of various parameters, communication with HART protocol. All Data of Sensor (Tag No., type, range etc.) is to be input, modified and stored in EEPROM.